With this posting, I am finally getting back to blogging. Several parishioners recommended that I use the materials that I am already generating for the parish bulletin, and post these. So here goes, with the first one: Elijah the Prophet. Oh, and we bless cars today in his honor! 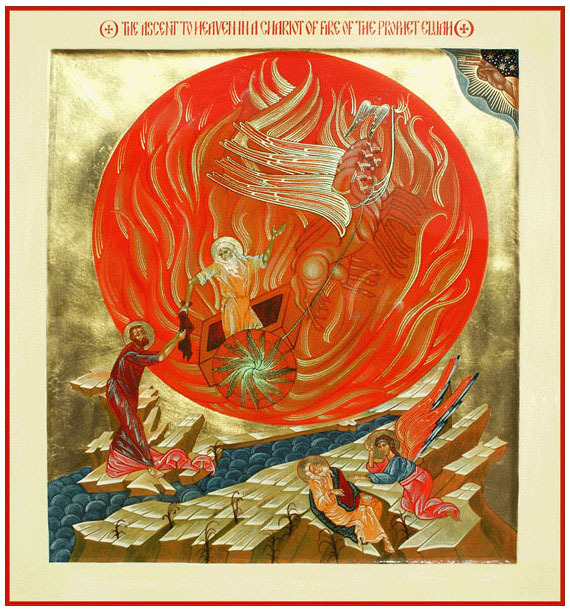 Today is a glorious feast, the ascent of Elijah, or Elias, into heaven in a chariot of fire, while he hands his cloak down to his disciple, Eliseus. This feast is commemorated on July 20 every year, by Catholics, Orthodox, and by the Carmelites, who see Elias as their spiritual ancestor. Elijah erupts on the scene in 1 Kings, where he appears as the Servant of the Living God, and rebukes King Ahab for allowing his Canaanite queen, Jezebel, to establish and promote the worship of the false god Baal inIsrael. A drought ensues as God’s punishment for this sin. When he flees for his life, God arranges for him to flee to a cave near the stream of Cherith, where ravens bring him his daily bread. When the stream dries up in the drought, the Lord sends him to a pagan widow, who is about to eat the last of the flour and oil in her house with her son, and then lie down to die, as the drought is causing famine. God miraculously multiplies her stock so that all three live well, but then the child dies. At the tears of the widow, Elijah throws himself across the boy’s body, beseeches God to have mercy, and God sends the boy’s soul back into his body. Thus the Lord cares for these pagans who have sheltered His prophet while Israel, which has abandoned worship of the Lord, starves. Elijah is sent back toIsrael by God after three years of drought and famine, and he again chastises King Ahab for encouraging the worship of Baal. In a dramatic showdown, two altars are set up at Mount Carmel, one with dry wood and a slaughtered ox where the priests of Baal dance and slash themselves with knives while singing his praises, and one with water-soaked wood and a trench filled with altar. The pagan priests do not obtain results, but when Elijah calls on the true God to respond, He sends down fire from heaven which consumes not only the wood, but the altar and sacrifice. He goes off to the edge of the Mount, and spies a small cloud coming. This cloud, he tells his servant, will bring the drought to an end, and indeed it unleashes torrential rains across the land. Queen Jezebel tries to kill Elijah, but he flees again to Mount Horeb. Here the wonderful revelation of God takes place, in the still silence of a gentle breeze. After other events, Elijah is taken to heaven in a chariot of fire; his disciple Elisha, or Eliseus, beseeches him to send down his cloak so that he may have a portion of his prophetic power, and indeed Elisha catches the cloak and thus becomes a new prophet. Elijah appears again in the book of Malachi (3:19), which predicts that he will come to prepare the way for the Messiah. To this day, an empty seat is left at the Passover table by Jews, who await the coming of the prophet. Orthodox and Byzantine Catholic families do this on Christmas Eve, when the prophet is awaited to announce the birth of Jesus, and the first person to enter the house must be a man. This role as announcer has been fulfilled by St. Johnthe Baptist who preached in the wilderness, dressed like Elijah, and preached the need for repentance to prepare for the Lord. Elijah is mentioned four times in the gospels, most notably at the Transfiguration on Mount Tabor, where he appears to affirm that Jesus is the long-awaited Messiah. Elijah is the spiritual father of the Carmelite Order; European ascetics lived on Mount Carmelduring the Crusade era and wore a white habit slashed by black marks which were seen as the wheel-marks from his chariot. Tradition claims that Carmel was home to an ancient school of prophets who would come from the wilderness to chastise and warn Israel. The caves however had been long abandoned before these men settled here for lives of prayer and silence, in imitation of Elijah who went away from the world. Saint Albert of Jerusalem gave these men, the hermits of Our Lady of Mount Carmel, their first Rule in 1209-1214. In 1238, the Carmelite friars were driven out by the Muslim re-conquest of the Holy Land, and they took their Elijah and Marian traditions with them to Cyprus and then to Europe. The Carmelites are known especially for the devotion of the wearing of the Brown Scapular, a small version of their habit, which depicts the image of Carmel on end and that of Our Lady of Mount Carmel and the Christ Child handing the scapular to Saint Simon Stock.